This flavorful udon noodle dish is loaded with pan-seared vegetables, marinated tofu, and topped with a spicy sesame dressing. 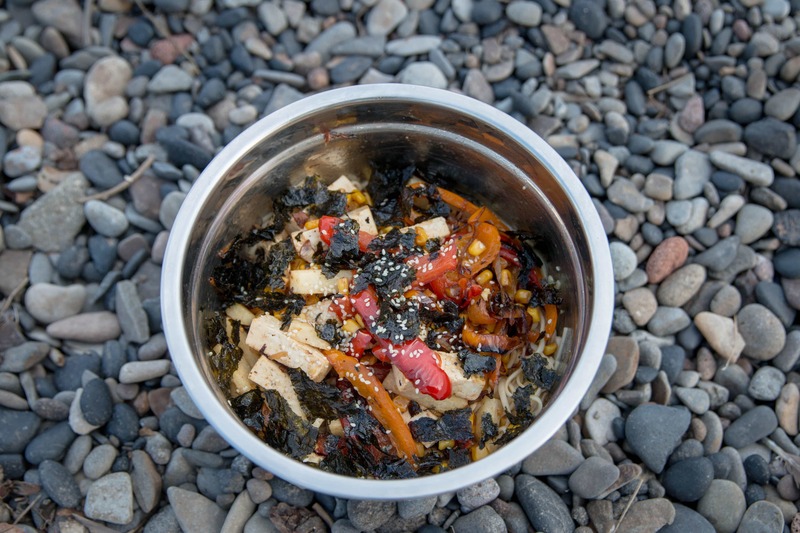 Fresh Off the Grid contributor Leslie Carvitto shares this recipe and explains how with just a little prep work, you can enjoy a spectacular meal like this out in the wild. My husband and I had just arrived in Lake Tahoe after two days of solid driving that began in Seattle. The streets in Tahoe City were lined with restaurants to choose from, easy and delicious meals that could fill our growling bellies within 10 minutes. 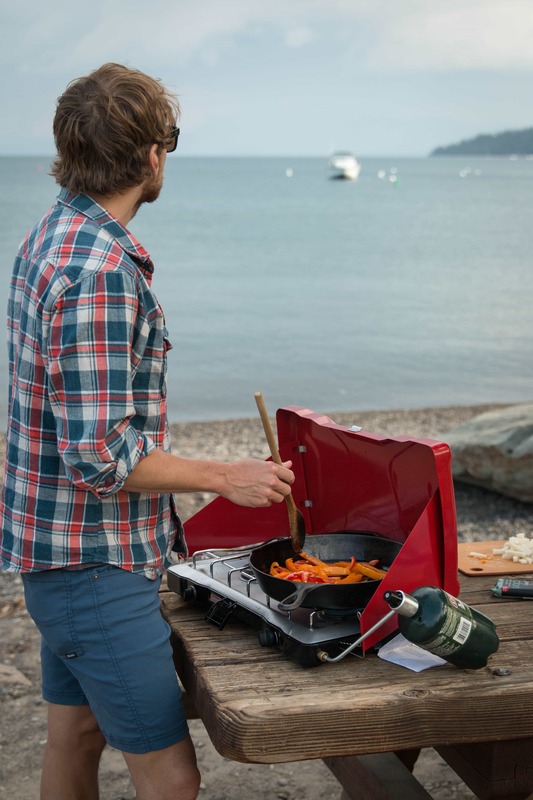 Yet, I was more excited to find the perfect spot by the lake, bust out our grill and cook our meal while watching the sunset. 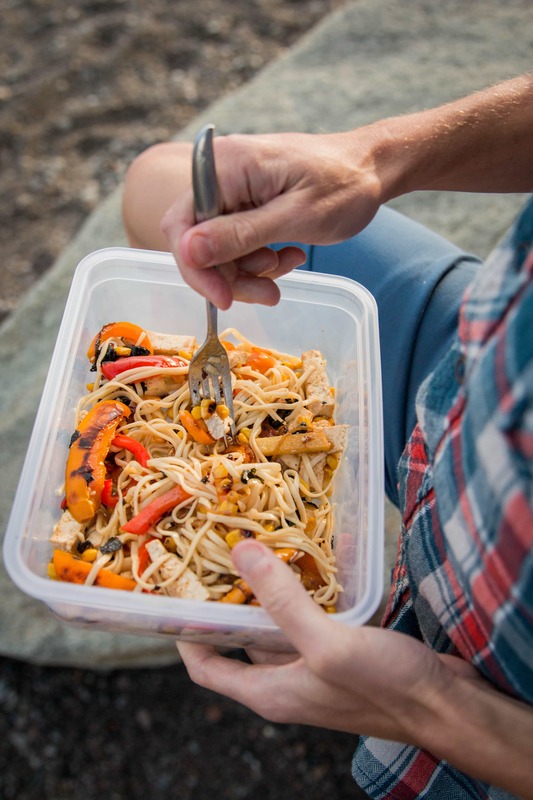 We planned ahead and packed all the ingredients and equipment to make a tasty udon noodle salad with tofu and veggies. 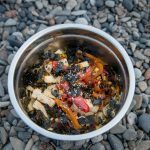 I tested out a similar recipe in our kitchen the week before and instantly dubbed it travel worthy with a few adaptations. 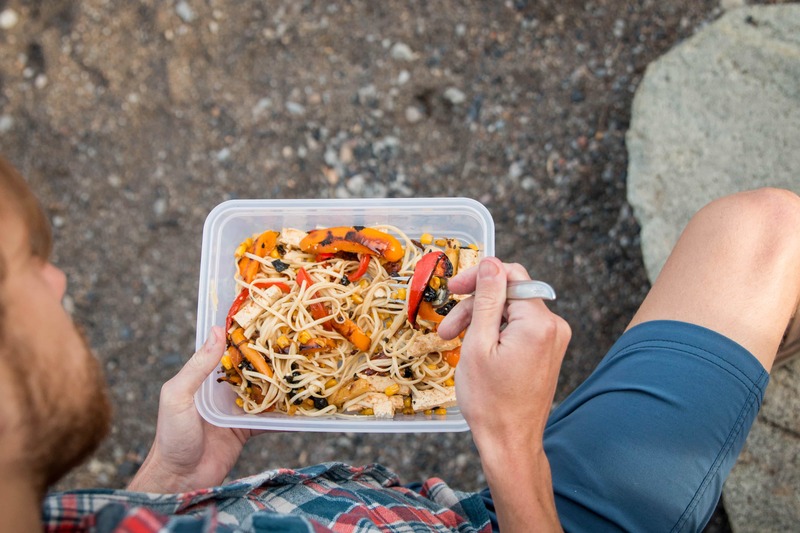 When we’re on a road trip or camp cooking, we strive to make our meals both delicious and easy (in that order, preferably). I’m sure we’ve all experienced the meals that are easy to make but taste awful or foods that are delicious but take WAY too much energy and time to cook. One of the time savers of this recipe is that you can do ingredient prep before you pack. Prep the marinade salad dressing and marinade the tofu before leaving the house and a quarter of the work is already done! This bright salad is a refreshing meal with hearty and nutritious ingredients. It makes for a great feast after a day of activity in the wilderness. Or, in our case, after a day of less than satisfying road trip snacks. Rinse and drain tofu by setting it in a strainer to remove excess liquid. Slice into small rectangles and lay in a shallow bowl. Add tamari and rub the tofu with the pressed garlic. Coat both sides evenly. Tofu can remain covered in a fridge or cooler for up to three days. Boil a large pot of water and add udon noodles. Cook according to directions on the package or until tender. Drain the noodles and set aside. 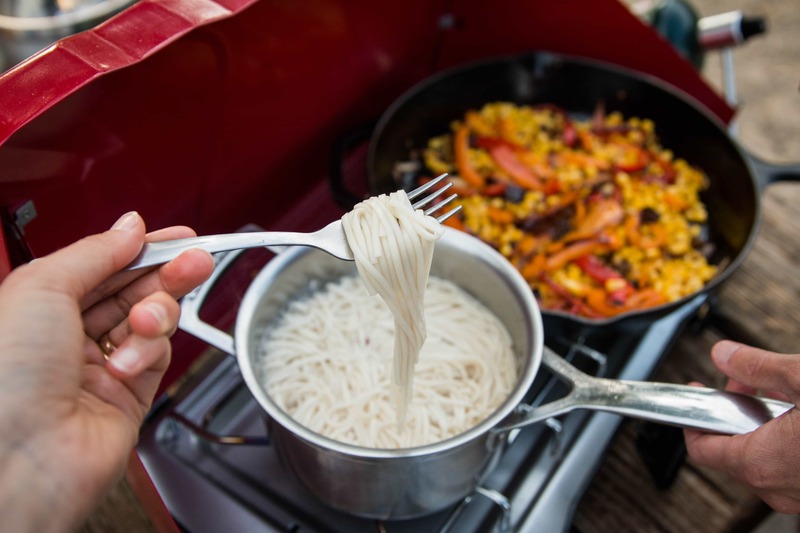 If you have access to cold water, rinse the noodles to stop them from sticking together. Otherwise, add a little sesame or extra virgin olive oil to the pot and mix it with the noodles. 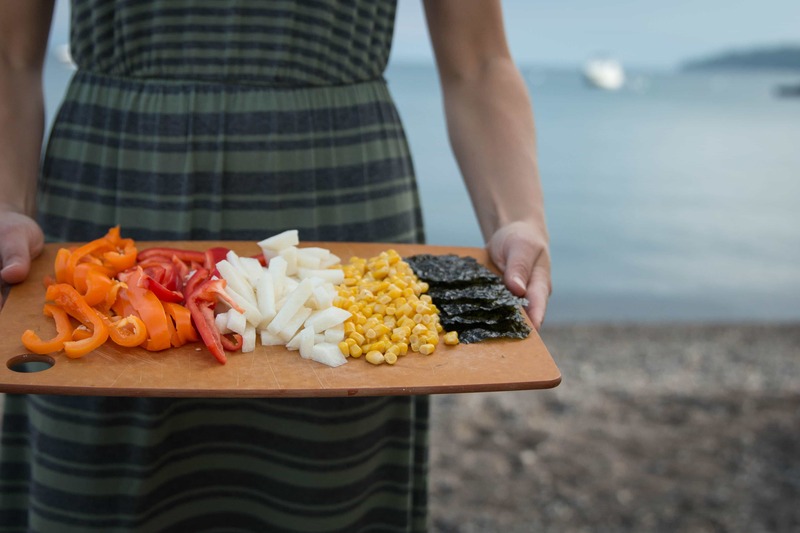 Cut all of the vegetables (bell pepper, jicama, scallion) into thin slices. Warm oil in a cast iron or skillet over medium heat. Add the scallions and peppers and saute for 8-10 minutes. Stir in the salt and cook for an additional 5 minutes before adding in the corn and jicama. Cook all ingredients together for another 5 minutes or until peppers are cooked through and beginning to brown. 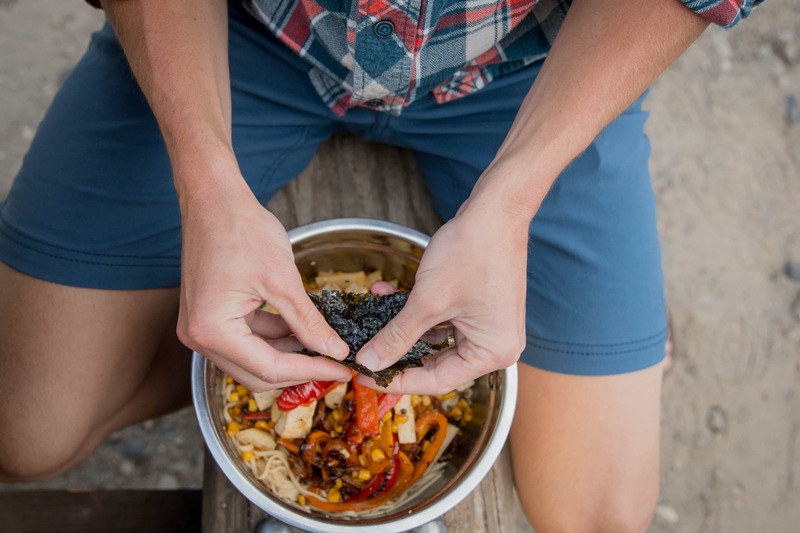 Add grilled veggies to the bowl of noodles, sprinkle with sesame seeds, red chili flakes, and roasted seaweed. 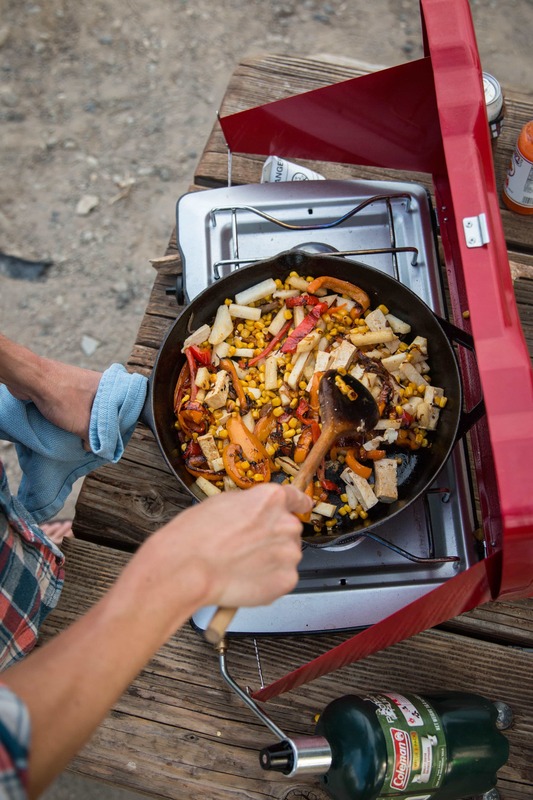 Reduce heat on the cast iron to low and cook marinated tofu for 5 minutes or until golden or starting to brown. Flip the tofu and cook for 4-5 more minutes until golden. Add tofu to the salad and mix all ingredients with the sesame dressing. Devour! Leslie Carvitto is a free-spirited wanderluster who has made proximity to nature a top priority. With an insatiable desire for travel, new experiences, and epic views, her time is spent hiking mountain ranges, photographing excursions, and documenting it on her blog Forever Stoked.